Most lovers of choral music know, or know of, at least a few motets and mass movements by the 16th-century English composer William Byrd. Even high school choristers have sung madrigals by his younger contemporary Thomas Morley and other Elizabethan composers. But English music of the earlier 16th century, from the reigns of Henry VII and VIII, is unfamiliar not only to most singers and music-lovers but to the majority of performers and scholars. There isn’t much of it, and what survives is complex and hard to perform. Many works are unusually long. The music lacks the obvious tunefulness and the expressive gestures that characterize English compositions of the later Renaissance. In addition, the composers are ghostly figures, each with just a handful of works attributed to him. Basic biographical information is lacking, making it difficult to associate anything like a musical personality with compositions. The greatest problem, however, is that what does survive is in fragments. Like ancient Greek poetry, the extant repertory is a tiny fraction of what existed, and what we have often requires extensive reconstruction. 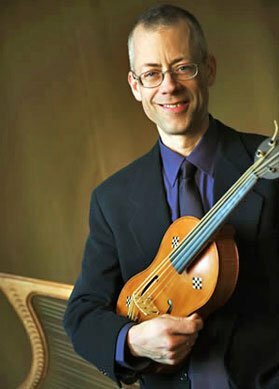 I offer this preamble to make clear the accomplishment of Scott Metcalfe and the singers of Blue Heron in their decades-long endeavor to bring early Tudor music to concert and CD. Saturday night’s performance, to a packed house at First Church in Cambridge, included splendid presentations of four major sacred works by John Browne, John Mason, Hugh Aston, and Hugh Sturmy. Only Aston is likely to be familiar even to early-music enthusiasts, this thanks to a single “hornepype” for keyboard, plus a harpsichord piece by Byrd known as “Hugh Aston’s Ground,” which may or may not have any connection with the older composer. In fact Browne and Aston seem to have been major figures in the English church music of their times, representing separate generations active around 1500 and 1540, but their vocal music has rested unheard for centuries, most of it preserved in two damaged sets of manuscripts. Director Metcalfe discussed these and other aspects of the music in an informal pre-concert talk. More details were provided in the evening’s program booklet, which as usual contained a wealth of information about the music, its manner of performance, and the singers. In the past, Blue Heron has made program booklets available on its website, but that doesn’t seem to have been the case with this one. A pity, as this seemed to me a particularly fascinating program, thanks to its inclusion not only of two generations of early Tudor church music but of secular compositions belonging to the same periods. Metcalfe also made clear the royal connections. Some of the secular songs were copied down in what is known as Henry VIII’s Book. The sacred items were heard in cathedrals and colleges whose virtuoso choral music was part of what Metcalfe described as a public display of royal patronage and piety. Eton College, whose famous choir book preserves the earliest of these compositions (Browne’s “Salve regina”), was not an undergraduate institution in the modern sense. It was a grand late-medieval foundation of Henry VI, in whose magnificent Gothic buildings a professional-caliber choir of monks was to ornament worship services attended by high-ranking members of the aristocracy. To be sure, poor boys also received instruction, and Metcalfe might have reminded listeners that Eton remains one of the most prestigious “public” schools in Britain. David Cameron is only the most recent prime minister to have attended it. Thus Browne’s composition is of distinguished provenance. Thirteen minutes in duration, it is far longer than a typical motet by one of his better-known contemporaries on the Continent, such as Josquin. It is also distinct in style, clearly of the Renaissance in terms of basic sonority of five vocal parts, but echoing older types of music in its ornate, unpredictable melodic lines. Certain features (mentioned in Metcalfe’s program notes), such as the wide gaps between the highest and lowest voices and the reduction of the texture to just two or three voices for individual phrases of the text, are distinct to English music of the period. So too are the complicated cross-rhythms, which had been long abandoned by Continental composers. Unfortunately these were sometimes swallowed up by the acoustic, although I have no reason to doubt that the virtuosos of Blue Heron were executing them brilliantly. I’m not sure I fully agree with the director’s assertion of the “rhetorical efficiency” of this music (the phrase comes from musicologist-composer Fabrice Fitch). Certainly these compositions are not rhetorical in the way of later music, or even of Josquin. There is, for example, hardly any text painting—the use of melodies or rhythms that suggest the meanings of the words sung to them. Exclamations such as the opening “Salve regina” (Hail, queen!) are set off by use of the full choir, alternating with more discursive phrases for smaller groups of voices. Yet there are long passages in which Browne’s free-flowing treble melody and intricate part-writing for the lower voices make it hard to hear any equally distinctive musical rhetoric. Despite the wonderfully modulated singing, it was sometimes difficult to follow the Latin words. That would not have been considered a problem by the first singers or audiences of this music, which predates the famous “reforms” that made it mandatory for composers to present sacred texts in a way that made them readily audible. Even the later pieces by Mason, Sturmy, and Aston, written during what Metcalfe described as the “chaotic” period of the English Reformation, retain an early-Renaissance style. Nevertheless, Aston’s “Ave Maria ancilla trinitatis,” which closed the program, conveyed the tranquility and timelessness that Metcalfe mentioned. One was hardly conscious of the piece’s extraordinary 15-minute length. Although it came at the end of a long program, Blue Heron realized perfectly the dramatically surging ascents of its final Amen. Equally extraordinary was Mason’s “Vae nobis miseris,” composed for five low parts and performed Saturday by Blue Heron’s 10 male singers. The remarkable sonorities of this piece could emerge only with the perfect intonation of this ensemble, which was led ably by tenor Jason McStoots while conductor Metcalfe sat to the side. I was only slightly less enthralled by the secular songs. Several of these, which took the form of rounds or canons, may well have been “a gas to sing,” as Metcalfe put it. But they might have been presented with a little more energy and a little less emphasis on their doleful or purely lyrical aspect. That said, the obscure composers Daggere, Cooper, and Kempe were certainly cultivating a late-medieval sort of sadness that had gone out of fashion on the Continent by the early 1500s. And there were some very affecting moments in William Cornysh’s “Adew mes amours,” the evening’s sole French-texted work. Sung by soprano Shari Alise Wilson and three other soloists, its concluding line achieved almost madrigalian intensity, surprising in a work of this early date. I was also impressed by Margot Rood’s very sweet singing in the anonymous “Madame d’amours” (English despite its opening line). A trio headed by countertenor Martin Near sang expressively in “Alas it is I” by Edmund Turges or Sturges. The program notes informed us that this work is sometimes thought to be by Robert Fayrfax, but the latter’s “That was my woo” struck me as more turgid and rambling despite being well-sung. A slight reservation about one aspect of the program. The music by Mason, Sturmy, and Aston is preserved only in the Peterhouse Partbooks. This is a set of manuscripts now housed at Peterhouse College in Cambridge England, although originally written in 1540 for Canterbury Cathedral. Once five in number, these now comprise just three books and fragments of a fourth. The book containing the tenor part is lost, as is a portion of the soprano book. Blue Heron’s longterm project to perform and record this music rests on the work of the English musicologist Nick Sandon, who has devoted his career to reconstructing the missing music. Metcalfe praised Sandon as a brilliant “partner” of composers whose music would otherwise remain silent. Nevertheless, some of what we heard Saturday night was actually Sandon’s music, especially in Aston’s piece, where two of the vocal parts are his, including the prominent soprano. Only occasionally, especially within Mason’s work, did I wonder about the style of what I was hearing. There, I suspect that the repetitive character of the music was a result of the many close echos between voices moving in the same range—a feature of the original which one might or might not consider a weakness, but in any case not something entirely due to Sandon’s reconstruction. Still, as in the opening of Aeschylus’s The Libation Bearers, or whole poems by Sappho, what we have is in part the creation of an editor. Restoration is necessary if we are to experience these works. With ancient Greek poetry we have the benefit of centuries of scholarship, generations of editors building on one another’s work. For Tudor music, Sandon and Blue Heron are pioneers. Although I’ve carried out my own musical restorations for compositions by Bach and Handel, I am hardly in a position to evaluate Sandon’s work within this much more recondite repertory. If an ear as fine and as attuned to this music as Metcalfe’s is satisfied, I can hardly say more. Still, I wonder whether Sandon’s involvement should not be have been noted a little more prominently. Sandon himself is appropriately modest about his contribution. He writes (in a note to Blue Heron’s first CD): “I would not claim that my restorations are definitive, but I hope that they may help to gain for this music some of the attention that it deserves.” The beautiful and moving results achieved by Blue Heron prove that he has succeeded at more than that.